I am using this site now as simply an extension of my personal spiritual journey, by including some of my daily (or at times not truly daily) journaling here. I’ll draw from any of the following studies that I decide to use on any given day. This year I am reading through the New Testament and “Books of Poetry” from the Old Testament. I also (at a slower pace) am going through the other O.T. books in the order that they are in the Bible. I have a Wednesday evening class that I teach to young children from which I may draw notes as well. Sometimes I might even jot down something I’ve heard in a message of some sort that has meant a lot to me. This year I am part of a Scripture memory (& review) group on a Xanga site begun by the wife of our senior pastor. If anyone else is interested in a sort of Scripture memory plan/accountability ~ here is that site’s address. Finally, I will still put in some of my prayer schedules for the day or week; and I will place a worshipful song or two on my PlayList, as I use music a lot in my times of worship and meditation. For today, I’m just going to put down the meditation that I used with my children’s class tonight. 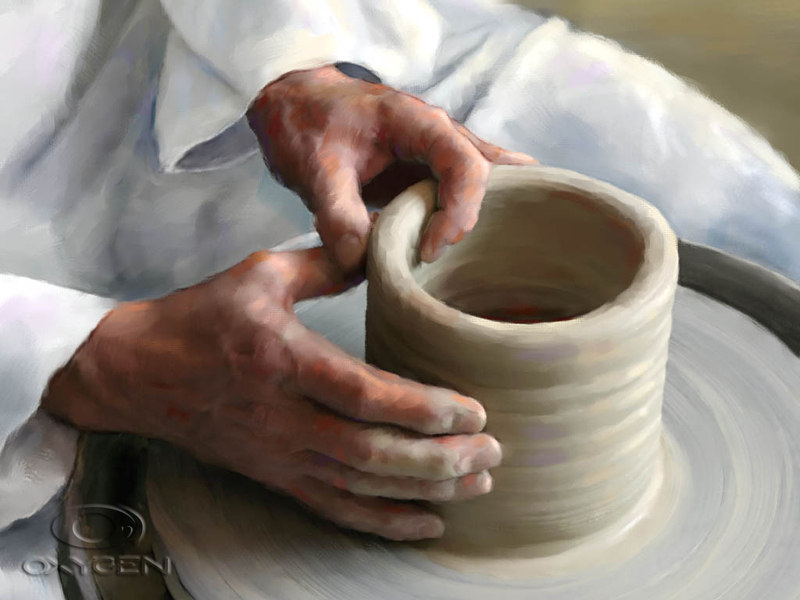 In our last classtime, we talked about the fact that God is THE POTTER, and we are HIS CLAY to use us and mold us as He wishes to do so for His own glory. We reviewed that, and then among the songs that we sing tonight, we discussed the chorus of one of the worship songs that we sing in church on that theme. That led us into our prayer time; and then afterwards, I surprised them each with some clay to mold, & some googly eyes for their clay face. We had talked about how foolish it would be for the clay to complain to the Potter: “Stop! I don’t like what You are doing with me.” As they molded their clay, there were no “complaining-clays” mouthing off to the little fingers of the little “potters” either! Here are the words to the song, “Potter’s Hand” ~ written by Darlene Zschech. Lead me Lord I pray.